With increasing clinical, scientific, and third-party attention being paid to outcome reporting, instruments for measuring standards have become common in the medical literature. Definition of an outcome and assessment of its efficacy require both an understanding of the disease process and a therapeutic goal that can be objectively measured. The primary treatment goal in venous disease is palliative and varies among physicians and patients. To measure and report only the clinical outcome of therapy through morbidity and mortality statistics omits many collateral effects and potentially serious implications. To fully assess an outcome, the effects on the physician, patient, and community should be reported.3 This notion is at the heart of quality of care that considers quality-of-life. There are many definitions of quality-of-life and as many ways to measure it, including instruments completed by the patient or physician. For a qualityof- life instrument to be a valuable measure of what is intended, it must be reliable and valid. For it to gain popularity among researchers and clinicians, it must also be practical.4 Reliability evaluates the consistency of patient responses. Validity evaluates the ability of a question to measure the object variable and examines the consistency of responses to questions over time.5 Practicality is a function of the study at hand and the information that can be collected to provide the necessary data. Quality-of-life instruments include both generic and disease-specific surveys. Generic surveys assess global states of well-being and provide a subjective measure of treatment efficacy. They have high comparative value for unrelated diseases and are generalizable between studies.4 These help establish the relative priority of a procedure, especially when determining costeffectiveness in an era of limited resources. Disease-specific surveys focus on elements associated with particular disease processes and treatment effects. This increases the sensitivity to trends and outcomes of the condition being studied.4 The survey questions are geared toward expected trends in the study of a particular condition and are more focused in their scope than generic instruments. They have become much more popular in venous disease reporting. A widely used and well-validated instrument is the SF- 36, developed over time with questions in physical health (the patient’s level of functioning) and mental health (a measure of well-being). These 2 categories have been broken down into 8 domains that include physical and social functioning, role limitations due to physical or emotional problems, mental health, pain, vitality and health perception. The survey generates a score ranging from 0 to 100, with higher scores indicating better general health perception.4 The SF-36 has proven to be a good fit for generic quality-of-life assessment in chronic venous disease patients. The CIVIQ comprises 20 questions in four quality-of-life domains: physical, psychological, social, and pain. The first version of the CIVIQ instrument, the CIVIQ 1, was validated in a sample of 2001 patients, 50% of whom had been diagnosed with venous insufficiency and the remainder of whom presented to a general practitioner for other reasons. A revised version of the instrument, equally weighed the categories across the questions to provide a global score.3 In 3956 patients, CIVIQ-20 showed good internal consistency and reliability (above 0.80) through test-retest correlations. The discriminating power of items was good in known groups of patients. Factor analysis identified physical, psychological, and pain factors as important, but revealed instability of the social factor. CIVIQ-20 was highly sensitive to changes in the quality-of-life of patients clinically improved after drug treatment.9 Both versions of the CIVIQ have been used in studies3,9,10 and proven to be valid quality-of-life measurements. 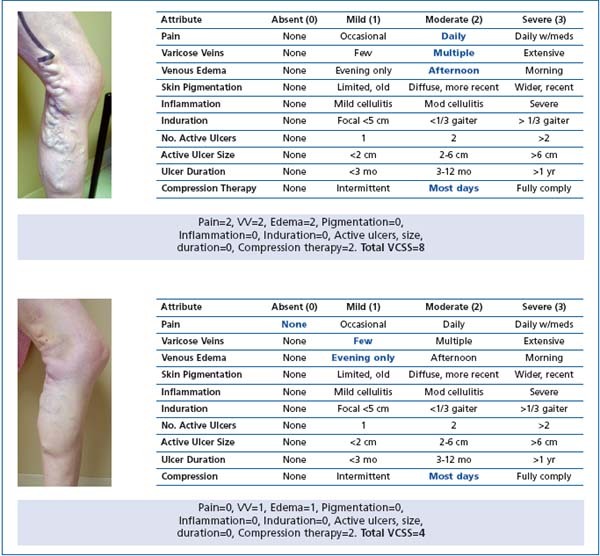 In a 1993 article, Garratt and colleagues12 evaluated 373 patients seeking treatment for varicose veins along with 900 persons from the community. The AVVQ was sent with an SF-36 questionnaire to all participants. After scoring, a high correlation was found between the AVVQ and the SF-36 for both groups of patients, with health perception lower in patients with varicose veins than in the general population. Guex et al14 designed a survey to address this gap in quality-of-life instruments and to be used in clinical practice. Their Specific Quality-of-Life and Outcome Response–Venous survey considers the primary complaint of the patient and the relevance to venous disease. They refer to this as a ‘patient-reported outcome’ in that it is a completely patient-driven self-report questionnaire designed following a review of existing questionnaires. This tool is unique in its consideration of symptoms, impairment of activities, appearance of the legs, and health-risk concerns. Consideration is given to account more completely for the main concerns of patients, including those in the CEAP C0 to C3 categories. Validated in a test (n ¼ 202) and retest (n ¼ 152) of a European patient cohort, the survey is undergoing English-language validation and additional studies to determine its ability to assess the effect of treatment across the spectrum of venous disease. Patient-related quality-of-life surveys are not without inherent problems. They may require significant time to complete, and the results can be cumbersome to follow and analyze in daily practice applications. The responses may be overly subjective and vary due to time elapsed since the onset of symptoms. The sheer number of surveys and the design and specificity of each can prove confounding to researchers trying to select one best suited to the problem at hand. The American Venous Forum in 2000 derived the Venous Severity Scoring (VSS) system from elements of the CEAP classification.19 The VSS system is an evaluative instrument designed to supplement the CEAP to allow for serial assessment. It has been proven to weather intraobserver and interobserver variability.20 The basic components of the system are easy to learn and apply. The features of the VSS are critically needed for longitudinal follow-up of a patient’s clinical condition during and following an intervention.2 There are 3 components of this new scoring system. Venous Disability Score (VDS). The VDS evaluates the effect of venous disease by quantifying the level of workbased disability. It is scored on a scale of 0 to 3, based on the ability to work an 8-hour day with or without provisions for external support. The total score represents the degree of disability attributable to venous disease. Venous Segmental Disease Score (VSDS). The VSDS uses the anatomic and pathophysiologic classifications in the CEAP system to generate a score based on venous reflux or obstruction. The score is obtained by imaging vein segments with duplex Doppler or phlebography. Venous Clinical Severity Score (VCSS). The VCSS includes 9 hallmarks of venous disease, each scored on a severity scale from 0 to 3. In order to generate a dynamic score, VCSS categories are scored individually, which adds emphasis to the most severe sequelae of venous disease that are likely to show the greatest response to therapy. These include skin changes and pigmentation, inflammation and induration, and ulcers (including number, size, and duration).19 The current version of the VCSS contains a category for compression, with higher scores representing greater compliance. Figure 1. Scores for each VCSS component showed significant improvement at each time interval over the course of follow up. Figure 2. The “visual language” of VCSS. Consistency in physician scoring and reporting allows a common language of venous disease to emerge. Basic Clinical CEAP 3, VCSS 8 (pre) – CEAP 3, VCSS 4 (post). Figure 3. The physician-generated “universal language” of VCSS and CEAP scoring CVD. The same patient changes from C6 – V27 to C6 – V19 and lastly C5 – V5. The strength of the VCSS lies in its ability to identify subtle intrasubject changes after intervention over time.20 The components of the VCSS provide outcome analysis on many levels, including technical, patientreported, and clinical. In this sense, the VCSS is unique among clinical outcome assessments and quality-of-life instruments. Although it is administered by a physician, components are scored based on patient responses to subjective questions. In contrast to more focused instruments such as the AVVQ and the CXVUQ, the VCSS considers most of the salient features of vein disease through clear evaluative parameters for each of its components. In 2007, through the American Venous Forum, an international ad hoc working group was created to revise the VCSS. The intention was to update the terminology, simplify the application, and clarify ambiguities. The additional objective was to protect the strengths of the VCSS, while acknowledging the limitations. Revisions to each of the clinical descriptors were made using, where applicable, quality-of-life language. The pain component now contains common patient symptoms (aching, heaviness, fatigue, soreness, and burning) that establish a venous origin. The effect on different types of daily activities is clarified. The varicose vein component has been modified to maintain consistency with the revised CEAP: the vein size criterion is greater than 3 mm. Telangiectasias and reticular veins remain without a score; however, corona phlebectatica (ankle flare) has been added to the mild category. The edema component presumes a venous origin and now reflects anatomic distribution and extent. Skin pigmentation has guideline criteria for anatomic distribution and extent and excludes non-venous causes. Inflammation has been expanded to include more than just recent pigmentation changes or underlying infection. Erythema, cellulitis, venous eczema, and dermatitis have been incorporated, as well as anatomic distribution and extent. Induration has been modified to reflect more severe venous disease. Chronic edema with fibrosis, hypodermitis, white atrophy and lipodermatosclerosis have been added. The ulcer categories have been refined to include size and duration to reflect the largest and longest active ulcers. The compressive therapy category led to the most discussion; and has now eliminated leg elevation to reflect that the category comprises only the wearing of compression garments. This revised VCSS is currently undergoing validation testing internationally. We believe fully in the usefulness and easy applicability of the VCSS for all venous practitioners. Those who treat patients who suffer want to follow up their clinical outcomes because these practitioners know that they are making a difference. They want a system that they can rely on and that they can use to compare outcomes with others elsewhere. The obvious truth is that quality-oflife and the VCSS are complementary tools. Quality-of-life language is descriptive, comprehensive, and patient-centered. That is why quality-of-life is widely appreciated by so many practitioners and payors. We believe that descriptive quality-of-life language should be added to the VCSS to clarify and improve it. Because the VCSS is physician-driven, this seems to be the natural conclusion. If we can find a way to marry the 2 tools, we can have something truly powerful to use clinically. Will there be a universal consensus as to which outcome tool should be used? It is incumbent on the responsible practitioner to do so. Quality-of-life instruments are valuable indicators of patient perspective, are proven to be reliable, and are appreciated by practitioners and payors, but the number of surveys is overwhelming. The VCSS is physician-driven and practical, but needs refinement. The obvious truth is that quality-of-life and VCSS are complementary tools. Quality-of-life language is descriptive, comprehensive, and patient-centered. To blend the patient’s language of quality-of-life with the physician’s evaluation of the VCSS seems too obvious a solution to ignore. What powerful simplicity! With the goal set to provide high-quality comprehensive care in the treatment of venous disease, we believe that the international venous community needs to arrive at a consensus as to how outcomes will be assessed and reported. This review is excerpted with permission from Phlebology December 2008 issue. Reference – Vasquez MA, Munschauer CE. Venous Clinical Severity Score and quality-of-life assessment tools: application to vein practice. Phlebology 2008;23:259–275. 1. Rutherford RB. Vascular surgery: Comparing outcomes. J Vasc Surg. 1996;23:5-17. 2. Vasquez MA. Guest Editorial: Why does outcome assessment dominate the landscape of vascular surgery? Am Venous Forum. Spring 2007;1:6. 3. Launois R, Reboul-Marty J, Henry B. Construction and validation of a quality-of-life questionnaire in chronic lower limb venous insufficiency (CIVIQ). Qual Life Res. 1996;5:539-554. 4. Davies A, Rudarakanchana N. Qualityof- life and outcome assessment in patients with varicose veins. In: Davies AH, Lees TA, Lane IF, eds. Venous Disease Simplified. TFM Publishing Ltd: Shrewsbury, Shropshire, England; 2006. 5. White JV, Jones DN, Rutherford RB. Integrated assessment of results: Standardized reporting of outcomes and the computerized vascular registry. In: Rutherford RB, ed. Vascular Surgery. 5th ed. Philadelphia, PA: WB Saunders; 2000. 6. Kundu S, Lurie F, Millward SF, et al. Recommended reporting standards for endovenous ablation for the treatment of venous insufficiency : Joint statement of the American Venous Forum and the Society of Interventional Radiology. J Vasc Surg. 2007;46:582-589. 7. Sharp B, Davies A. Quality-of-life in patients with venous ulcers. In: Davies AH, Lees TA, Lane IF, eds. Venous Disease Simplified. TFM Publishing Ltd: Shrewsbury, Shropshire, England; 2006. 8. Wann-Hansson C, Hallberg IR, Risberg B, Klevsgård R. A comparison of the Nottingham Health Profile and Short Form 36 Health Survey in patients with chronic lower ischaemia in a longitudinal perspective. Health Qual Life Outcomes. 2004;2:9. 9. Launois R, Mansilha A, Jantet G. International psychometric validation of the chronic venous disease quality-oflife questionnaires (CIVIQ-20). Eur J Vasc Endovasc Surg. In press. 10. Neglén P, Hollis K, Olivier J, Raju S. Stenting of the venous outflow in chronic venous disease: Long-term stent-related outcome, clinical, and hemodynamic result. J Vasc Surg. 2007;46:979-990. 11. Kahn SR, Lamping DL, Ducruet T, et al; VETO Study Investigators. VEINESQOL/ Sym questionnaire was a reliable and valid disease-specific quality-of-life measure for deep venous thrombosis [published correction appears on J Clin Epidemiol. 2006;59(12):1334]. J Clin Epidemiol. 2006;59(10):1049-1056. 12. Garratt AM, Macdonald LM, Ruta, DA, Russell IT, Buckingham JK, Krukowski ZH. Towards measurement of outcome for patients with varicose veins. Qual Health Care. 1993;2:5-10. 13. Smith JJ, Guest MG, Greenhalgh RM, Davies AH. Measuring the quality-oflife in patients with venous ulcers. J Vasc Surg. 2000;31:642-649. 14. Guex JJ, Zimmet SE, Boussetta S, Nguyen C, Taieb C. Construction and validation of a patient-reported outcome dedicated to chronic venous disorders: SQOR-V (Specific Quality of Life and Outcome Response–Venous). J Mal Vasc. 2007;32:135-147. 15. Meissner MH, Moneta G, Burnand K, et al. The hemodynamics and diagnosis of venous disease. J Vasc Surg. 2007;46(suppl S):4S-24S. 16. Eklöf B, Rutherford RB, Bergan JJ, et al; American Venous Forum International Ad Hoc Committee for Revision of the CEAP Classification. Revision of the CEAP classification for chronic venous disorders: consensus statement. J Vasc Surg. 2004;40(6):1248-1252. 17. Dayal R, Kent KC. Standardized reporting practices. In: Rutherford RB, ed. Vascular Surgery. 6th ed. Philadelphia, PA: WB Saunders; 2005. 18. Kakkos SK, Rivers MA, Matsagas MI, et al. Validation of the new venous severity scoring system in varicose vein surgery. J Vasc Surg. 2003;38:224-228. 19. Rutherford RB, Padberg FT Jr, Comerota AJ, Kistner RL, Meissner MH, Moneta GL; American Venous Forum’s Ad Hoc Committee on Venous Outcomes Assessment. Venous severity scoring: An adjunct to venous outcome assessment. J Vasc Surg. 2000;31:1307-1312. 20. Vasquez MA, Wang J, Mahathanaruk M, Buczkowski G, Sprehe E, Dosluoglu HH. The utility of the venous clinical severity score in 682 limbs treated by radiofrequency saphenous vein ablation. J Vasc Surg. 2007;45:1008- 1015. 21. Mekako AI, Hatfield J, Bryce J, Lee D, McCollum PT, Chetter I. A nonrandomised controlled trial of endovenous laser therapy and surgery in the treatment of varicose veins. Ann Vasc Surg. 2006;20(4):451-457. 22. Gillet JL, Perrin MR, Allaert FA. Clinical presentation and venous severity scoring of patients with extended deep axial venous reflux. J Vasc Surg. 2006;44:588-594. 23. Ricci MA, Emmerich J, Callas PW, et al. Evaluating chronic venous disease with a new venous severity scoring system. J Vasc Surg. 2003;38:909-915. 24. Perrin M, Dedieu F, Jessent V, Blanc MP. Evaluation of the new severity scoring system in chronic venous disease of the lower limbs: an observational study conducted by French angiologists. Phlebolymphology. 2006;13:6-16. 25. Masuda EM, Kessler DM, Lurie F, Puggioni A, Kistner RL, Eklöf B. The effect of ultrasound-guided sclerotherapy of incompetent perforator veins on venous clinical severity and disability scores. J Vasc Surg. 2006;43:551-555. 26. Meissner MH, Natiello C, Nicholls SC. Performance characteristics of the venous clinical severity score. J Vasc Surg. 2002;36:889-895. 27. Marston WA, Owens LV, Davies S, Mendes RR, Farber MA, Keagy BA. Endovenous saphenous ablation corrects the hemodynamic abnormality in patients with CEAP clinical class 3-6 CVI due to superficial reflux. Vasc Endovascular Surg. 2006;40(2):125-130. 28. Hartung O, Otero A, Boufi M, et al. Mid-term results of endovascular treatment for symptomatic chronic nonmalignant iliocaval venous occlusive disease. J Vasc Surg. 2005;42:1138-1144. 29. Kahn SR, M’lan CE, Lamping DL, Kurz X, Be´rard A, Abenhaim LA; VEINES Study Group. Relationship between clinical classification of chronic venous disease and patient-reported qualityof- life: Results from an international cohort study. J Vasc Surg. 2004;39:823- 828. 30. Kurz X, Lamping D, Kahn S, et al. Do varicose veins affect quality-of-life? Results of an international populationbased study. J Vasc Surg. 2001;34:641-648. 31. Lamping DL, Schroter S, Kurz X, Kahn SR, Abenhaim L. Evaluation of outcomes in chronic venous disorders of the leg: development of a scientifically rigorous, patient reported measure of symptoms and quality-oflife. J Vasc Surg. 2003;37:410-419. 32. Vasquez MA, Munschauer CE. Venous Clinical Severity Score and quality-oflife assessment tools: application to vein practice. Phlebology. 2008;23:259–275. 33. Meissner MH. “I enjoyed your talk, but…”: Evidence-based medicine and the scientific foundation of the American Venous Forum. Presidential address presented at: American Venous Forum 20th Annual Meeting; February 22, 2008; Charleston, South Carolina.